I had a great Fourth of July with my daughters, who treated me to an afternoon and night aboard the USS Hornet, as apt a place as any to celebrate U.S. independence. The Hornet was really buzzing (heh) yesterday, with a couple thousand people enjoying a day of food, drink, bounce houses, bands performing on two levels (Hangar and Flight decks), plus an entire aircraft carrier to explore. I particularly appreciated meeting some of the other docents, generally older gentlemen who served on the Hornet or ships of her era and had very interesting stories to tell as well as nice compliments about my girls. As Karen and I say, it's like Laura and Robin have 50 grandpas. Then at night everyone gathered at the Flight Deck's stern to watch fireworks, which I honestly think were disappointing for some. Too low and distant. Not for me, though. Sitting in the cold bay breeze watching glowing dandelions of light puff into the sky was the perfect cap to a full day. Flight Deck of the Hornet (facing the stern), laid out with picnic tables, a band stage, food and beverage tents, and porta-potties. The silhouette of San Francisco is visible on the horizon. If I'm not mistaken (and there's a 60-40 chance I am), I shot this photo in the very spot President Nixon stood when he welcomed Armstrong, Aldrin and Collins back from the Moon. Looking the other direction toward the bow, where some aircraft and bouncy-houses were lashed to the deck. My girls Robin and Laura on their way up the staff gangway. Laura did a four-hour docent shift yesterday, which is why she's in the navy and khaki uniform. Looking sharp. Laura also took the time to give me a private tour of some parts of the ship normally closed to visitors that I hadn't seen before. Here in the Engine Room, I'm givin' her all I got, Cap'n! ("Bridge, she canna take any more!") Laura later explained that the two wheels I'm so desperately spinning controlled the "ahead" and "astern" steam valves, and by opening both simultaneously I probably would have blown up the turbine. This is why I don't service my own car. I shot the above video walking from one end of the Hangar Deck to the other. PLEASE NOTE that at the beginning of the video I state that I'm walking from bow to stern. I'm actually doing the opposite. I knew that! Seconds before shooting this, I was standing out on the ship's fantail (i.e., the back end) and knew exactly where I was. I just misspoke. This is why I don't service my own garbage disposal or lawn mower, either. A sorry attempt at artistry. Again, that's San Francisco in the distance, with the Sun setting behind the Bay Bridge (as well as a crane barge thing docked next to the Hornet). While the Hornet's history of service during World War II, Korea and Vietnam make it an interesting historic artifact, it is the ship's service in the exploration of space that really gets me tingling. The video below is a quick survey of some of the ship's Space Age artifacts. I preface the narrative saying I shot it just for Friend O' The Blog Jim O'Kane, but everyone else is welcome to watch, too. I'll have a few notes on the other side. The Sea King helicopter is the same type used to recover Apollo astronauts from the Pacific after splashdown. However, this is not the original #66, but was painted with its livery for use in the movie "Apollo 13." The Hornet acquired the chopper after filming and kept the paint job. The Apollo Command Module capsule CM-011A was used for suborbital tests in 1966. This very capsule was shot into space and recovered by the Hornet, and still has a big dent in its underside from drop-impact testing conducted after it returned. Also in the video is the Mobile Quarantine Facility, a modified Airstream trailer used to isolate astronauts returning from the Moon to protect the Earth from hypothetical space germs. This particular MQF was used for Apollo 14, which the Hornet did not recover; however, nearly identical trailers were used for the astronauts of Apollos 11 and 12, who were retrieved by the Hornet. The "Gemini Boilerplate" is a dummy Gemini capsule used for testing. It's tiny; hard to believe two men fit inside (the real ones, that is). Me in one of the three most famous Airstream trailers in the History of Forever. 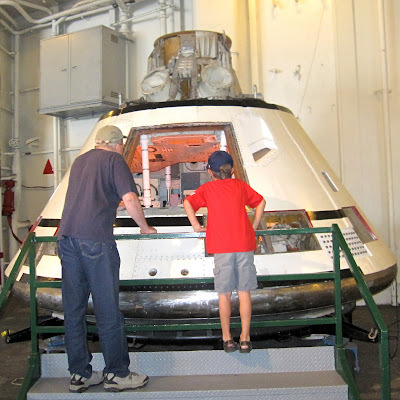 My daughter Robin took this photo of me and a random boy inspecting the interior of the Apollo capsule. He walked right up and explained everything to me. I posted this picture to my Whatever Happened to the World of Tomorrow Facebook page because this is exactly what my book is about. My girls and I spent the night aboard ship and emerged around 8:30 this morning to find the Hangar Deck deserted. We took a chopper for a spin around the Bay and then went home. Thanks to my girls for giving me an Independence Day that was more fun for me than Father's Day and Christmas put together! And again, if you're ever in the East Bay with a few hours on your hands and the remotest interest in any of this stuff, I highly recommend a visit to the Hornet. Ask for Laura. Holy Smokin' Wernher von Braun on a crutch, Brian - that was an awesome tour! I have to show these videos to my daughter in order to shame her into getting a job at the Smithsonian, or Wallops Island or something. Daddy needs an all-access pass. My New Thing I Learned Today was something that should have been obvious - - I knew CM-011 was a suborbital flight, but I didn't realize the end of the parabola would be off Wake Island in the middle of the Pacific. I always thought they just flew the ships straight down the Atlantic range, but of course they had to give the Pacific fleet a chance for trying out real-life tracking and recovery in their own ocean. Trivia: not sure if it's true of the Apollo XIV Airstream, but the Apollo XI Airstream was equipped with aircraft seats donated by Braniff International. Based on the "harvest gold" hue, I'd say they came from the same lot. The only thing unaccomplished on your tour is to get a six-wheel drive ATV and zoom around the hangar deck like Bruce Dern. Don't forget the blue long johns! "We took a chopper for a spin around the Bay and then went home." So YOU were the one who almost clipped me while I was testing out my jetpack. Watch where you're goin' buddy. Again, what a great post. And Robin looks like a good sport. Sherwood, there were doctors, a NASA PAO, and -- I think some kind of steward / cleanup guy assigned to the trailer on its long journey from the middle of the Pacific to beautiful south Houston. The chairs needed to be aircraft-style seats because NASA shoved the whole Airstream into a C-141 cargo plane when the Hornet reached Hawaii and then they overnighted the plane to Texas. Thanks, Jim! That was better than googling, for sure. Jim, always appreciate your perspective and context. I love Dern and "Silent Running" (Trumbull! ), and the Hangar Deck would've been perfect to spin some ATV doughnuts this morning, although it's sadly lacking in poker-playing robots. Robin and Laura are both good sports. I asked their permission before posting that video and they let me, for a very reasonable bribe. I always wondered how they picked those other guys trapped in the Airstream. "All right, there's a non-zero chance you'll catch some alien disease we've never seen and can't cure, plus you can't let yourself be seen by the press so there's no glory in it. Volunteers?" I have just directed Husband's attention to this post. He will be sick - SICK - with envy.